Happy Friday Wyrdos! 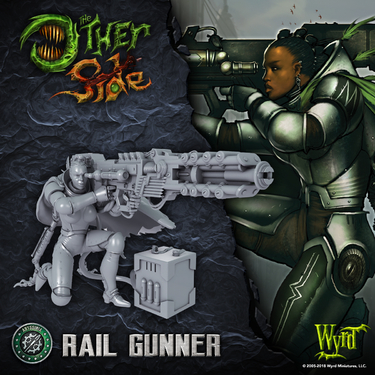 We have a pretty awesome preview of the Rail Gunner. This model definitely shoots for the moon, and with the size of that gun it probably will hit it too! Enjoy this preview. Although not yet in widespread circulation, Abyssinian weapons technology has created relatively small scale rail guns usable on the battlefield. These weapons require an incredibly strong source of power, and as such, must be deployed with a Soulstone-amplified power source. Most Rail Gunners are recruited out of the Mechanized Infantry, drawing upon those with the best accuracy. On the tabletop, the Rail Gunner gets one powerful, long range shot per Turn. Taking advantage of Extra Power to get a Gunner into Glory can lead to a particularly potent shot. Target priority is the key for a Rail Gunner, as it can be very effective against certain targets, but may be overkill or ineffective against others. What are you most excited to blow off the table with the Rail Gunner? So Edmonton’s dinky little rifley thingy gets a tripod, but these railguns just hang off of the gunner’s shoulder? I appreciate the box, though. Looks like it’s cabled to the gun itself, as an external power supply? Helps ground the fanciful concept of the gun, to have that included. If you look the gunner also has mechanical supports behind her supporting her. Lots of cool little things in the model that makes it more grounded! Talk about compensating for something! I was going to say something about supports, so those back brace things are awesome! Either way she(?) looks like like a real blast to put on the battlefield! Ok, those are neat. Much cooler than the close-combat baton I thought that was. My what an electrifying model! And here I was hoping it would be a mounted on a train. Seems like a pretty linear method of accelerator-ed destruction. At the very least, it should de-rail the opposition.